The perfect home office can help you lead a more balanced life—sounds strange, right? But when it comes to modern life, it's more important than ever to create boundaries around our work. Most of us are technologically switched on at all times of day and it's ever so easy to end up obsessively checking work emails at home—even in bed! So a good home office space will serve to create some very important physical boundaries. It might not stop many of us from checking work emails when we are supposed to be relaxing, but at least it will be a step in the right direction. 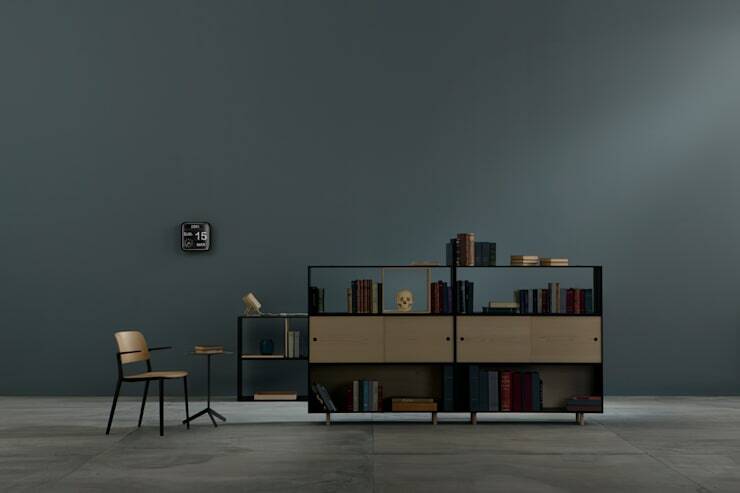 So how can we create the perfect home office? Well, today we present a few classic and modern ideas to get you inspired. Enjoy! 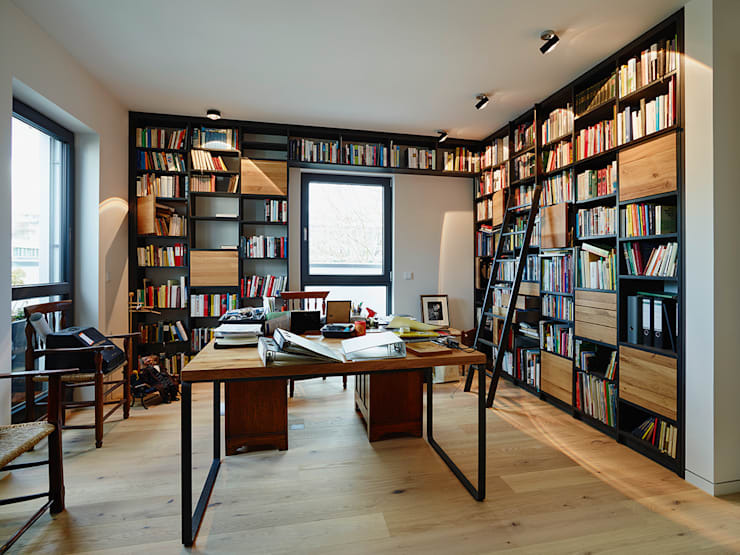 Physical books may seem a little old-fashioned to some, but they will give the home office a classic, timeless appeal. If you don't actually have that many books to store, consider installing some floor-to-ceiling display shelves. These could be filled with inspiring mementos, posters, quotes or objects that relate to the work at hand. Contrary to popular option, it's best to hide the humdrum or stressful objects that you might commonly use. These will start you thinking about unfinished tasks and increase stress levels. If you have the option, consider installing a mixture of open and closed storage units. Some people have mixed feelings about an all-white office decor. But white is neutral and doesn't tend to raise subliminal associations or strong feelings like a more bold colour might. 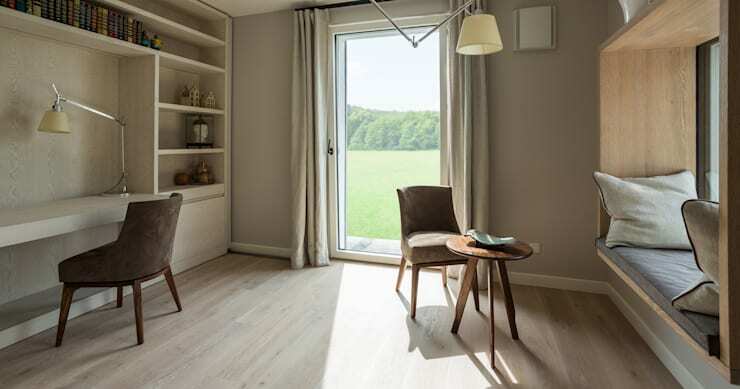 Colour therapy may sound a bit airy-fairy, but research has shown that people tend to feel less drained and more energised in an all-white room. People's brains are hyperactive and the slightest visual prompt is likely to get their minds running off on wild tangents. Most of the time this happens unconsciously and we aren't even aware of it. We all know how terrible it is to sit in a chair for long hours. It doesn't just mess up your back and shoulders—it's also bad for your waistline. Despite this, lots of people use standard chairs around the home for their home office. We guess they don't really want to commit to the idea of working at home! So spend the money on investing in a comfortable office chair and test it out properly before you leave the shop. Finally, invest in a comfy little shawl to make your home office that little bit cosy. This is a place we're supposed to enjoy… right! This desk is built for a small child but would suit an adult just as well. Children, like adults can have short attention spans, so it's important to set up the home office in a position for easy focus. It is always best to avoid setting up the desk within eyesight of a television, beside a major walkway or close to distractions. Many people feel that it's best to completely remove distractions and window views altogether. But research has shown that it's easiest to focus in an office space with a window view that overlooks natural foliage. 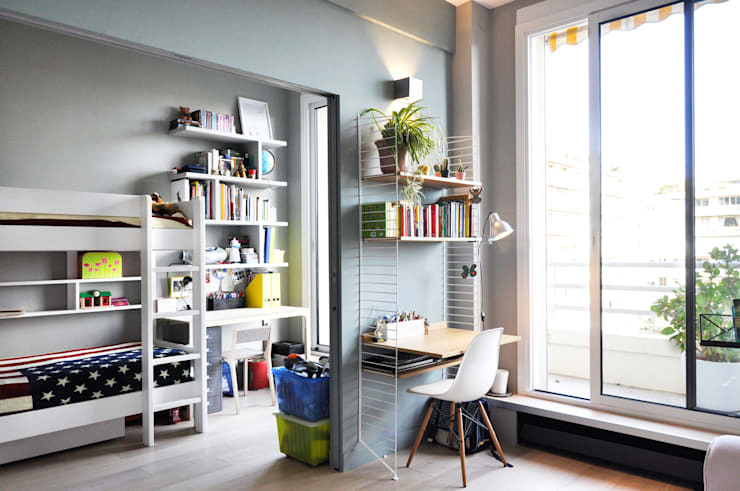 Whatever your feelings on this, we feel that this home office arrangement is good for those with a small space. The desk faces the wall and the occupant has a side view out the window. Creativity is a huge part of our modern work lives. This is how we make the seemingly random connections that really lift our game in the digital sphere. But creative work can be tricky to encourage because it requires a less linear approach to problem solving. It can be helpful to set up a small daybed near the desk space. The secret is not to make it too comfortable! When it comes to the home office, great task lighting is an absolute must. It's easy enough to rely on the light from an illuminated screen but this will strain the eyes and induce headaches. A good lamp can be mounted on the wall, strip lights could be attached to overhead shelves or a simple table lamp could suffice. The key is to create a strong even light around your work area. Office accessories bring out the nerd in a lot of people. Cool little gadgets, organisers and pinboards can make one feel awfully efficient. 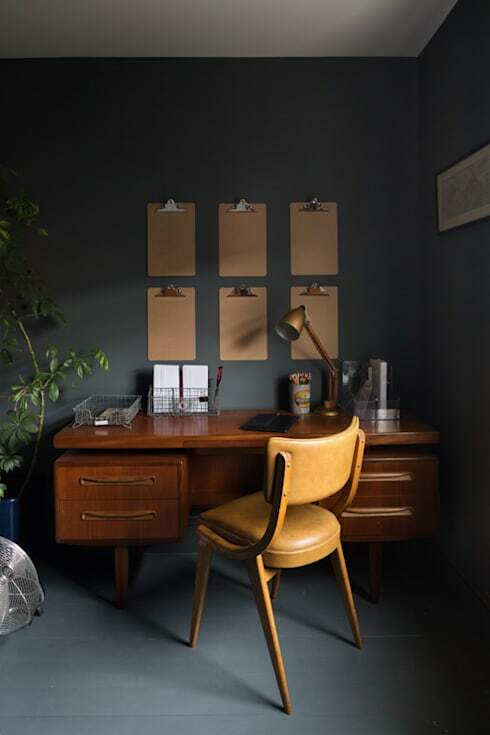 Perhaps you could even use a bunch of clipboards as a decorative statement. Digital organisers may be more sophisticated, but there's something compelling about having a physical reminder of a project right on the wall. Filling out some printed to-do lists will also create a reason to get up, stretch and do something physical. Chances are that you'll get more work done as well. If you love the efficient feel of an all-white decor, you'll love this project… The perfectly designed loft apartment. 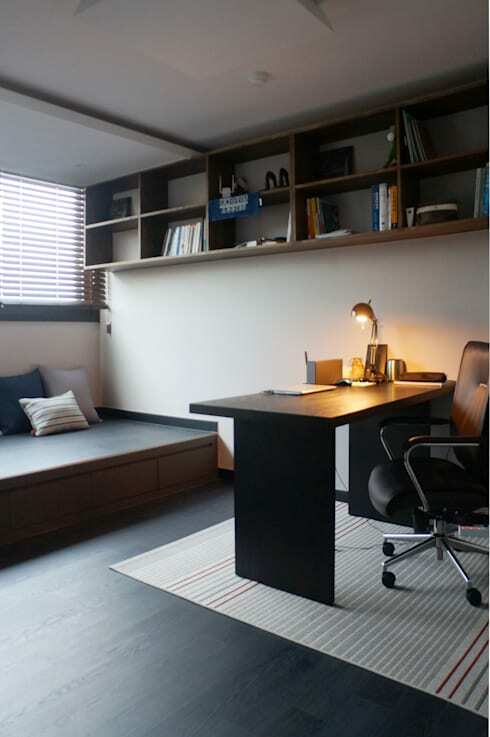 Do you have any more tips on how to create a great home office?